So with my diagram plus a detailed cut list and supply list in hand, I headed to Home Depot. 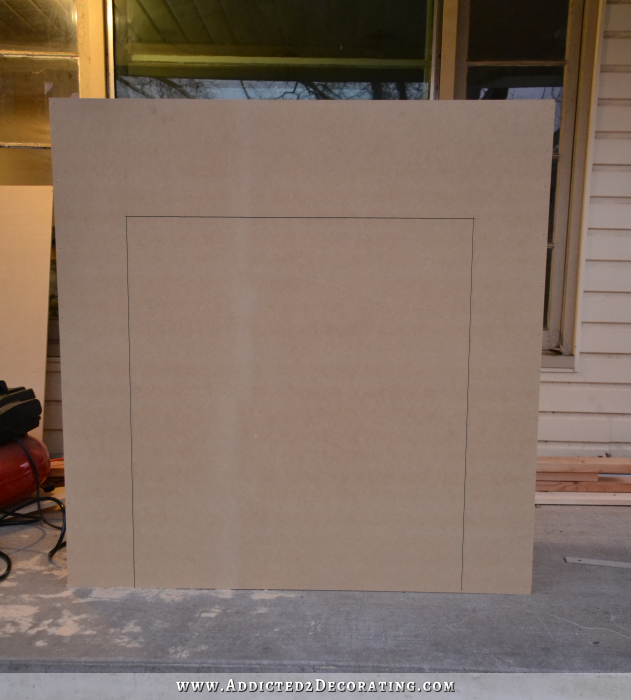 By the way, when I go to Home Depot to get MDF or plywood cut, I always make a drawing showing exactly how I want my pieces cut from each piece of MDF or plywood, and I even make notes of the order in which the cuts need to be made for maximum efficiency and so that I come home with the most perfectly cut material possible. It saves so much time in the store, not to mention the fact that the HD employees never, ever want to cut the material in the way that makes the most sense. For example, from my diagram above, I had them rip the 11.5-inch strip off the top first. Then with the remainder, I had them measure over 49 inches and cut. Then I had them set the saw to rip (cut horizontally) 15.5 inches from the bottom. (This is where they never think like I do. They always want to measure from the top, and cut, then measure from the top again, and cut. If they measure from the bottom and set the saw once, they can rip both pieces without having to measure and reset the saw again. Plus, each piece will be exactly the same size.) So after setting the saw 15.5 inches from the bottom, I had them rip the two 15.5 inch pieces. 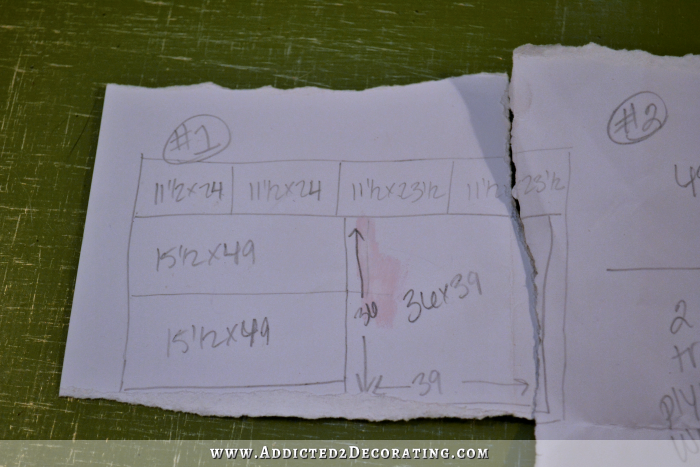 Then from the remaining MDF, they measured and cut the 36 x 39 piece. So I literally go in and tell them, “I have a diagram here, and if you’ll just do exactly what I tell you to do, this will go really fast!” And then I direct them through the whole thing. 🙂 I’ve never had anyone get irritated with me for doing that, and in fact, most seem really appreciative that they don’t have to waste time figuring out how to get the pieces I need cut out of one sheet of material. Anyway, after being delayed for a few days because of weather, and then getting ready for my father-in-law to come here from Oregon (he’s staying for two weeks and will be helping me get some things done around the house!! ), I was finally able to get started yesterday. Granted, I didn’t get much done at all, but at least it’s a start! 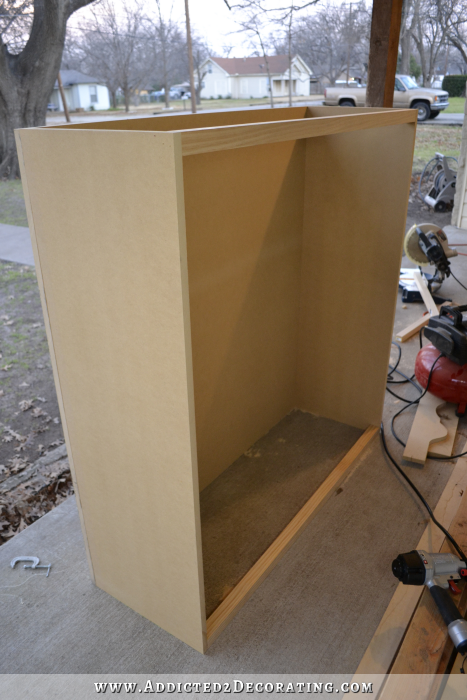 I started by using wood glue and a nail gun (16 gauge 1.5-inch nails) to build the basic box that will form my fireplace. 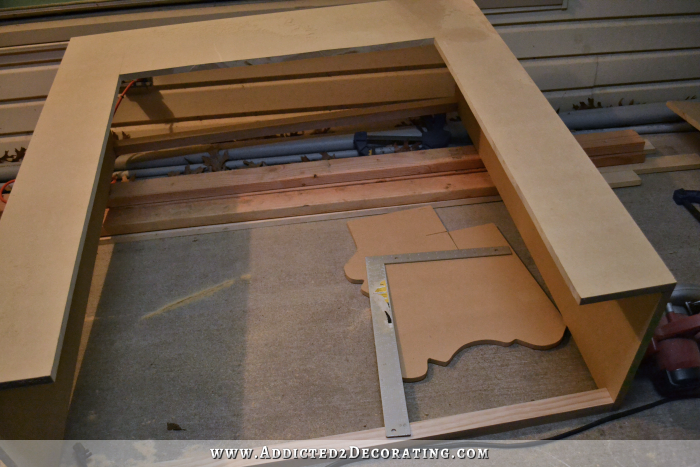 I had all of the pieces cut from 3/4-inch MDF. The front piece is 48w x 49h. On the sides, I attached the 15.5 x 49 pieces. And then to brace the back, I cut two strips of 1 x 2 lumber to 46.5 inches long and nailed inside on the top and the bottom. And then on the front, I measured and marked my cut lines where I would cut out the rectangle that will allow for the decorative tiled inset as well as the firebox to be attached. Next I used my circular saw to cut along the lines. The two side lines were easy to do, but I had all kinds of trouble with the top line since I couldn’t start cutting on the edge. I had never done a cut like this with a circular saw, where you have to start several inches from the edge, so I ended up kind of butchering it. To remedy my bad cut job, I re-measured and re-drew a new line (at 10.75 inches down instead of 11 inches like I had planned), and then used my jigsaw to cut along the line. That cut was much better, but still wasn’t perfectly straight, so I had this brilliant idea. 🙂 I got a piece of lumber and placed the edge right along the line that I drew and used two nails to secure it in place. And then I used my sander to sand the MDF right up to the straight edge of the lumber. It worked! I ended up with a perfectly straight top edge on the opening. 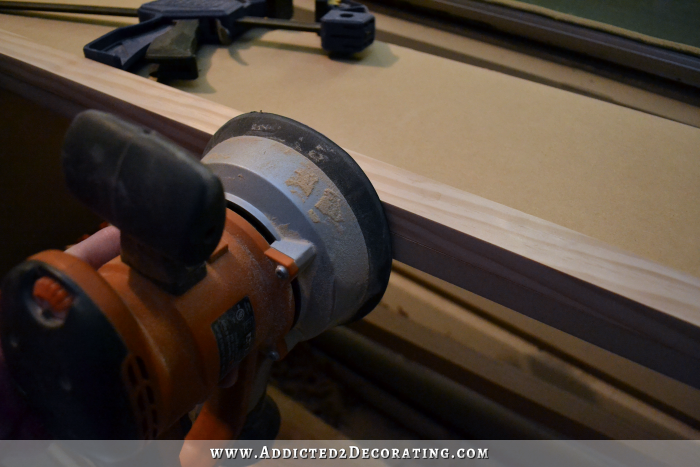 I’m so glad I went with MDF instead of plywood, because this little trick would not have worked on plywood. 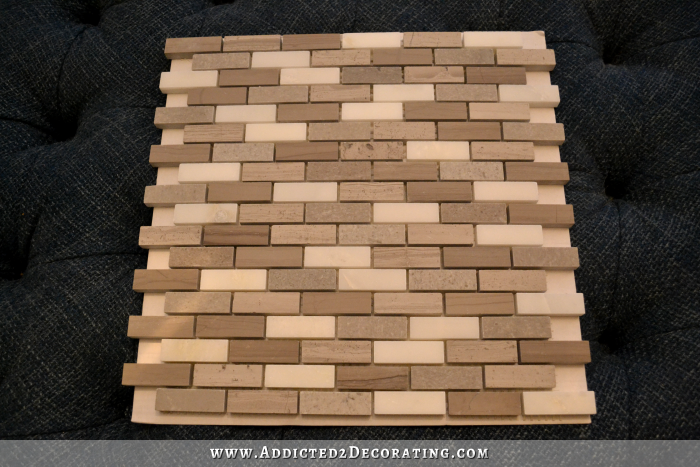 And here’s a peek at the tile that I got for the fireplace. I found it at Home Depot, and it doesn’t say specifically what kind of stone it is, but it looks like a combination of various marble and granite. I’m hoping to finish up all of the building today (with the exception of the mantel), and then maybe do the tiling and painting tomorrow. 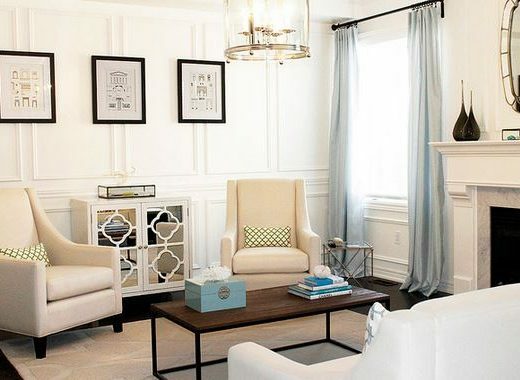 Living Room Fireplace Color — White Or Gray? Previous Post Q & A--Decorating Ideas For This Small Living Room? We’re still in the drawing out the plans and waiting for the block layer to get back with us – as we are going to block in a wall of windows that opens up to nothing but the building next door. So, it is the perfect place for my new fireplace. We are also blocking in a door in the laundry room that we don’t need and won’t shut correctly – so, it is going away also (I’m just trying to decide if I want to put a window in or just block in the whole door (blocking in the whole door is winning right now). We shall wait and see how much the block layer is going to cost before my hubs and I start on the building of the fireplace. Looking forward to seeing how your turns out! The fireplace came out great, and the whole room is gorgeous. I’m excited to see how it turns out. When I saw your plan with all those little squares, I just knew you were going to make them yourself. I love the tile you picked. Looking forward to the end result….Have a Blessed Day and Happy Building. I really admire all of your handy work and I love your color schemes. I have been dreaming about building the same thing in our living room, but I’m a little less confident in my carpentry abilities. Where did you gain all of your DIY knowledge? Did you take some classes or was it a bit of trial and error? Also, I appreciate that you show your bumps in the road on your blog. It is nice to know that mistakes aren’t detrimental and that even a seasoned professional can have second thoughts on their original plan. I think beginners like myself need to see that sometimes projects take a different path than originally planned and that there is no need to get discouraged. That is some kind of fabulous!! 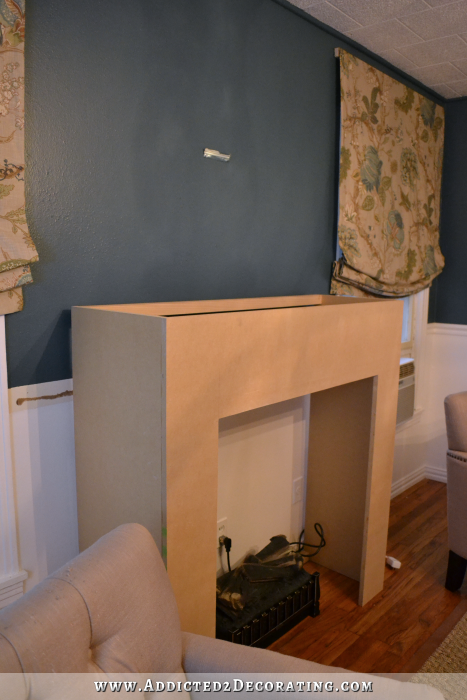 The fireplace should look great, I look forward to the completed project. Wow! I love the trick you came up with to straighten your cut edge! I’m going to tuck that away for a rainy day. My prep and planning is always the longest step. Thanks for sharing your process with us. I value it and greatly appreciate it. 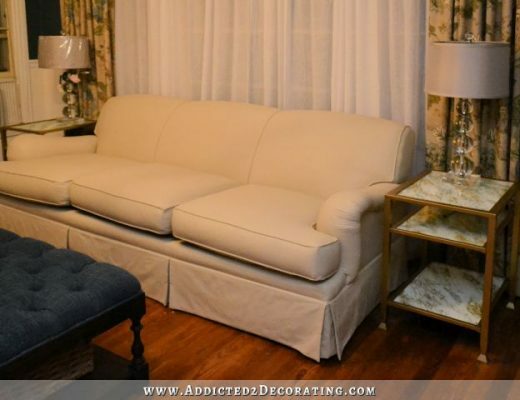 Love to watch your mad decorating skills transform! You absolutely blow me away!!!! Look at how much progress you made already. 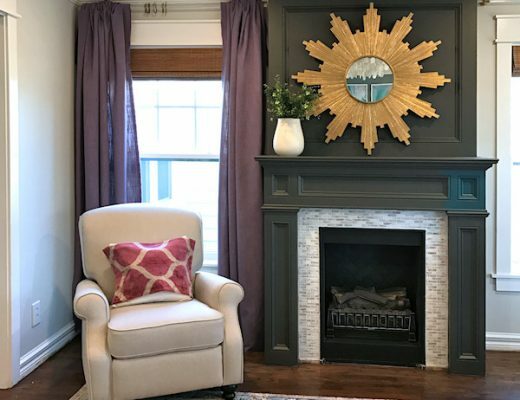 I think what amazes me most about you is your sheer courage and confidence in just saying, “Oh yeah, I can build a fireplace mantel.” and then you do. Amazing. Can’t wait to see this finished. My project this weekend was to clean off the kitchen island (which was piled 3′ high) and finish the laundry I had started last week. You definitely have me beat! I’ll be awaiting the finished project; the tiles are very nice. I’m so excited to see where this goes! You’re an inspiring woman Kristi! Are you going to attach it now, or wait until the foundation is leveled? I can’t wait to see this done! As usual, you are taking something ordinary and making it extraordinary! My brain has a difficult time with math and seeing all the measurements you had to figure out would have sent me over the edge. I’m sure the HD employees are more than happy that you’ve done all the hard work and they only have to do the cutting. I hope you’ll do a review of your electric fireplace insert. I want to get one after we have the old gas heater taken out of ours.. Would love to know how you like it and if yours gives off any heat. You are really an engineer. Quite a double threat – an artist and an engineer. Actually, I have known engineers who couldn’t have figured out the order to make those cuts. 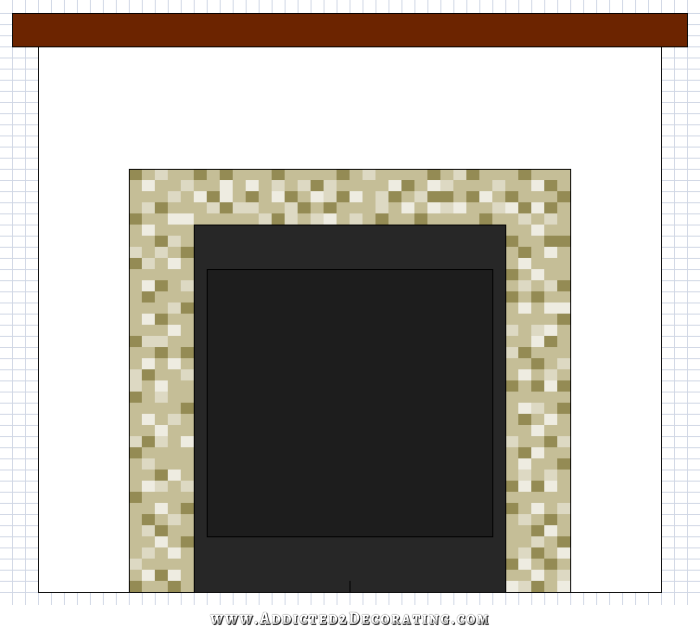 Your fireplace looks very much like the one I have designed to cover the ugly brick one in my 125 year old home. Previous owner took mantle and surround with them. I found some tiles that look just like Carrara marble. As soon as I finish refinishing my front door, I start on the mantle. I bought a Kreg jig based on what you have done. You have inspired me so much! No more waiting for hubby to get around to what I want to do (or not get around to it). Thank you for showing us your thought process and how you do things. Kristi it is looking good, can’t wait to see it finished. I don’t think that I have ever seen another designer/craftsperson with the amount of talent that you have. You amaze me every blog you publish! I have subscribed to many other blogs, but after a month or so when I see nothing new or unusual. I end up unsubscribing. But NOT with yours. I look forward every day to see what new things you have to teach us. Thank you for sharing your knowledge and talents with us. What a wonderful start. Love the size, perfectly proportioned with your windows. You will love it once it’s working. I keep dad’s turned on for him from before I get him up in the morning until after I put him to bed at night. Since it’s LED, it uses extremely little electricity. He thinks I really build a fire for him, even though I never turn the heat on. I think of it as a great decorating tool. I’m anxious to see how your build the inside firebox with slanted walls. Also the layering on for the mantle will make it wonderful. So glad Matt’s father can be there to help with some things you want done. You have terrific family. So far so good! Can’t wait to see the finished product. 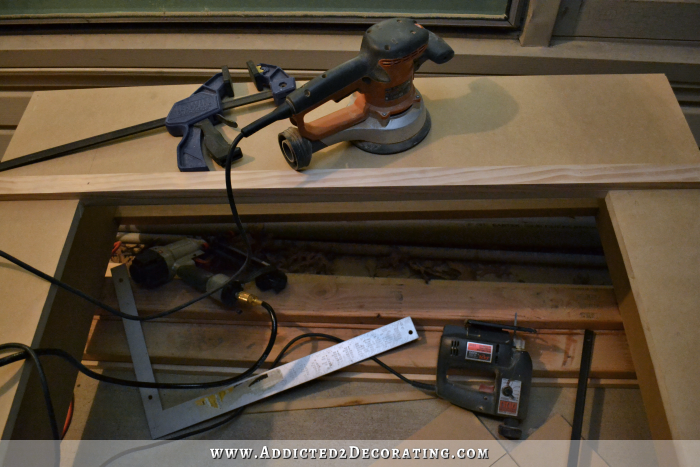 Whenever I use my circular saw or jigsaw, to get straight cuts, I clamp a piece of scrap wood down first. Once you have it in place with your blade on your line your good to go. Works every time! I can’t believe how fast you work and how much you get done. I love the lines of your fireplace and the tile you chose are really, really nice. Can’t wait to see it completed with the paint, fireplace inset, tile and mantle. Its gonna be beautiful I’m sure. Can’t wait to see the finished product!!! I cant believe how fast you are at things. And you must be able to work outside most of the time. It is so cold here I cannot work outside. I am trying to figure out how to paint and fix up dressers and desks and replace the carpet in one room with out taking anything out of the room, except the old carpet, and get it all done very soon. Is it weird that I’m really excited to see this???? AWESOME is always. Your talent is at the top with a 10+! Love the picture of the one you are doing, but I know you’ll end up making it look over the top and high end. Love your blog and I’m sure most will agree that checking to see if you’ve posted something each day is at the top of my list. Much good luck to you. I’m confused. Your box looks different then your drawing… the sides are narrower then the picture. Is what you have there going to be both the tile and wood part of the fire place? Wow, it’s not even remotely finished and I like it already! It’s going to be gorgeous when finished. That tile is beautiful. You are so organized and detailed – that is what separates you (along with your immense talent) from the rest of us. How you figure out things like your cut list is so smart – I’d never think to do that! beautiful design and thank you for sharing all your tips, designs and tips. Wow, looks like a lot got done to me:) Everything you do would take me 3x as long, I am not that handy with tools, actually I can’t do a lot of what you do. It will be beautiful! You have the “bones” finished. Whew. The planning and purchasing materials is stressful for me. I can’t wait to see the masterpiece completed. Wow, Kristi! Looks awesome already. I have the vision but not the mad carpentry skills that you have. You have my admiration. So glad you got motivated to start on this. I know it’s going to be just gorgeous when you are done with it. 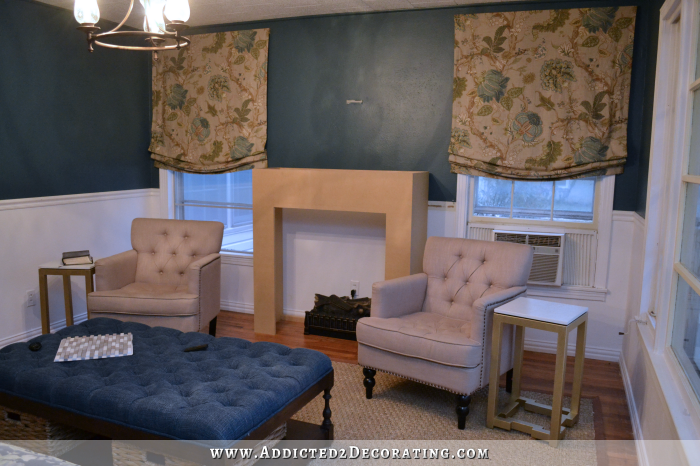 On another note, I wanted to let you know that Ballard Designs has blue grass cloth wallpaper. It’s gorgeous! Anyway, you probably already knew that but I figured I’d give you the heads up just in case you didn’t. I saw your finished fireplace and it looks beautiful! I was wondering if you kept track of all your expenses and if you have a total of how much the full surround costed you? It’s been a while, but if I remember correctly, it was around $300.